Building & looking after a pond is a pleasure if you start with the right advice and equipment. Our experienced staff are here to help you find the best pumps, filters, plants·& accessories. 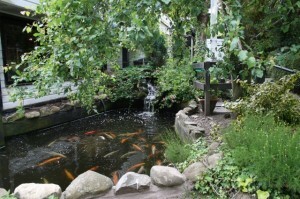 We are one of the most experienced pond builders and aquatic specialists in North Wales. Please note the main pond season is from March to the end of October, so if you are after aquatic plants or fish please visit in the warmer months for the best selection. We stock all dry pond goods throughout the year. Fish Stock List: 2019 stock list coming soon!! !